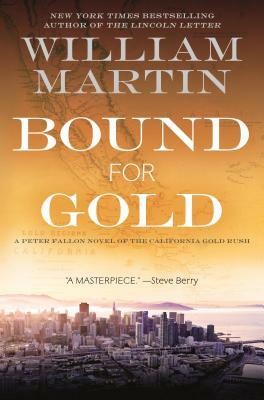 Bound for Gold continues New York Times bestselling author William Martin’s epic of American history with the further adventures of Boston rare-book dealer Peter Fallon and his girlfriend, Evangeline Carrington. They are headed to California, where their search for a lost journal takes them into the history of Gold Rush. The journal follows young James Spencer, of the Sagamore Mining Company, on a spectacular journey from staid Boston, up the Sacramento River to the Mother Lode. During his search for a “lost river of gold,” Spencer confronts vengeance, greed, and racism in himself and others, and builds one of California’s first mercantile empires. In the present, Peter Fallon’s son asks his father for help appraising the rare books in the Spencer estate and reconstructing Spencer’s seven-part journal, which has been stolen from the California Historical Society. Peter and Evangeline head for modern San Francisco and quickly discover that there’s something much bigger and more dangerous going on, and Peter’s son is in the middle of it. Turns out, that lost river of gold may be more than a myth. Past and present intertwine as two stories of the eternal struggle for power and wealth become one. New York Times bestselling author William Martin is best known for his historical fiction, which has chronicled the lives of the great and the anonymous in American history while bringing to life legendary American locations, from Cape Cod to Annapolis to The City of Dreams. His first novel, Back Bay, introduced Boston treasure hunter Peter Fallon, who is still tracking artifacts across the landscape of our national imagination. Martin's subsequent novels, including Harvard Yard, Citizen Washington, and The Lost Constitution. have established him as a “storyteller whose smoothness matches his ambition.” (Publishers Weekly) He has also written an award-winning PBS documentary and a cult classic horror movie. He was the recipient of the 2005 New England Book Award, given to "an author whose body of work stands as a significant contribution to the culture of the region." And in 2015 he won the Samuel Eliot Morison Award for four decades of bringing history to life. He and his wife live near Boston, the city that his recurring character, Peter Fallon, calls home, and he has three grown children.